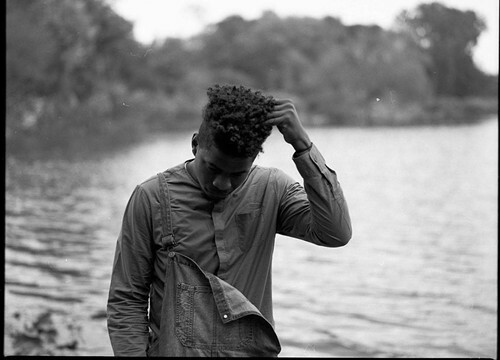 On "THC," the second song on Mick Jenkins's brand-new The Water[s], the south-side rapper dissects his inspired mixtape concept: "Water is the most important natural component we have today. It makes up our world, our bodies. It has the ability to destroy and create. It is the healing component, THC." It's also fluid, and throughout The Water[s] Jenkins reshapes and tinkers with his ideas of what water can be. Jenkins even built that free-flowing vision into his mixtape's stylized title: he recently told HotNewHipHop that he put brackets around the "s" in The Water[s] to emphasize the idea that there's more than one metaphor or straightforward interpretation for what water is in this mixtape. To play with Jenkins's concept a bit, his work on The Water[s] reminds me of Lake Michigan. His assured, cool rapping is as calm as the lake on a windless day, and his lyrics have more depth than I initially thought. And like Lake Michigan, The Water[s] is huge. It requires several full listens in order to get a handle on it—fortunately, the sumptuous soul-inspired instrumentals lend the mixtape a refined cool that invites playback. Jenkins provides much of the reason for keeping The Water[s] on repeat. Each song reveals new reasons to comb through Jenkins's lyrics, be it his sharp, short lines about racial tension and inequality ("irritate the white skin like a blackhead" on "Drink More Water") or his thoughtful commentary about the nature of entertainment inspired by real violence ("They callin' me conscious, Jiminy Cricket / Unfortunate events got me writin' like Lemony Snicket" on "Dehydration"). Jenkins's powerful performance makes his mixtape reflect another quality of water—it feels like a life force. This fast-rising south-side MC has used some of his best tracks to indict the racial divide that helped kill Trayvon Martin, Michael Brown, and Eric Garner. Two big local hip-hop shows kick off Saturday night, one featuring 90s legends Crucial Conflict and Twista, the other anchored by rising stars such as Mick Jenkins.